Where do you go for yield when The Fed keeps prevailing interest rates near zero forever? Naturally, you have to chase it, and the high-yield goose has led investors into some pretty funky junk debt neighborhoods lately. “Leveraged loans,” extended to junk-rated and highly leveraged companies, are too risky for banks to keep on their books. Banks sell them to loan mutual funds, or they slice-and-dice them into structured Collateralized Loan Obligations (CLOs) and sell them to institutional investors. This way, the banks get the rich fees but slough off the risk to investors, such as asset managers and pension funds. 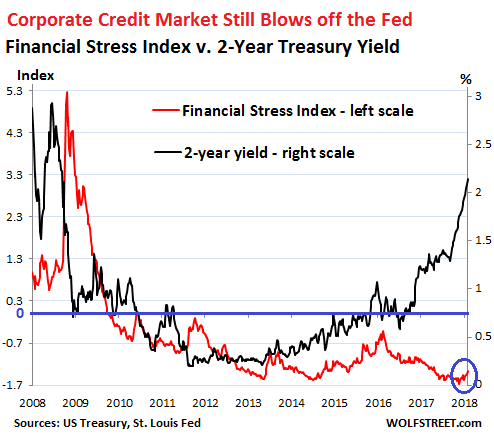 The St. Louis Fed Financial Stress Index tracks whether financial conditions are getting easier or more difficult (credit is getting tighter), and as you can see, it largely moves in lockstep with the 2-year yield. A reading of zero means ‘normal’ conditions. The horizontal blue line marks zero of the Financial Stress Index (left scale). At or above zero is where I — after reading the tea leaves — think the Fed would like to see the index at this point. But the index is far from it. And the CLOs mentioned above are examples of just how ebullient corporate credit markets still are at every level. A similar ebullience is still visible in junk bonds as well. The corporate credit markets are starting to take into account the risk of slightly higher inflation – hence the appetite for these floating-rate CLOs. But the risk premium over Libor and other risk premiums show that credit markets are still totally in denial about the bigger risk for junk-rated credits: the risk of default. And this risk of default surges when rates rise and financial conditions tighten as these companies have trouble refinancing their debts when they come due. But for now, investors are blithely ignoring that they’re in for a big reset.